We have received 34 reviews of Knighthood for Beginners . You can add a review or scroll down to read reviews. To send in your review of Knighthood for Beginners , please fill in the info below and click the button labelled Send Review Now. Reviews will be checked by our team before they appear on the website. Your last name will not appear on the site, but we need to know who you are in case you win a prize! Elys is an author and illustrator based in Cambridge, where she studied children’s book illustration. She works predominantly with ink, new-fangled digital witchcraft and coloured pencils, of which she is the proud owner of 178, but can never seem to find a sharpener. When not doing pictures and making things up, Elys enjoys growing cacti, working on her PhD about funny picture books and eating excessive amounts of fondant fancies. Dave is a dragon, but not a typical one. He’d much rather bury his nose in a book than a treasure hoard and when he picks up a second-hand copy of How to be a Knight, he knows he’s found his calling. Ably assisted by his trusty steed Albrecht who, though a goat, has all the requisite attributes – attitude, looks, glossiness, not to mention the ability to speak, and a decidedly colourful past – he sets out to win his knighthood. 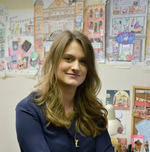 Fact 1: Many of her books have been shortlisted for book prizes! Doughnut of Doom and Steven Seagull Action Hero were nominated for the 2017 Kate Greenaway Award (a national award for illustrating children’s books). Fact 2: Weasels was shortlisted for the 2013 Roald Dahl funny prize and the Kate Greenaway in 2014. Zac gave Knighthood for Beginners 4 out of 5 and now plans to read Amelia Fang and the Barbaric Ball by Laura Ellen Anderson. This book was really funny .i really enjoyed it . I thought it was a bit sad to. Hannah gave Knighthood for Beginners 5 out of 5 and now plans to read Greta Zargo and the Death Robots from Outer Space by A F Harrold. This book is amazing!!! Dave is my favourite character because he always comes up with ideas like the one where he got out of jail with his steed Albrech. Also my worst character is the Kings wife because she kept a secret that she is actually a wicked witch! She put a curse on the kings daughter! My favourite part is when Dave beat all the kings knights! And when they find out there is a very bad doctor. Nada gave Knighthood for Beginners 4 out of 5 and now plans to read Greta Zargo and the Death Robots from Outer Space by A F Harrold. Ishbel gave Knighthood for Beginners 5 out of 5 and now plans to read Amelia Fang and the Barbaric Ball by Laura Ellen Anderson. It was funny and a bit too silly. My favourite bit was when he said ''I think I need the toilet''. Samantha gave Knighthood for Beginners 4 out of 5 and now plans to read Attack of the Alien Dung! by Gareth P Jones. I really like this book because it was really fun to read and I liked the dragon. My favourite character was dragon because it was very cute and funny. Eleanor gave Knighthood for Beginners 4 out of 5 and now plans to read The Incredible Dadventure by Dave Lowe. Everyone should read this book because it is funny and really good memories afterwards. Lyra gave Knighthood for Beginners 5 out of 5 and now plans to read Amelia Fang and the Barbaric Ball by Laura Ellen Anderson. Charlotte gave Knighthood for Beginners 2 out of 5 and now plans to read Me and Mister P by Maria Farrer. This book is so hilarious!It has funny pictures and a cute dragon.I recomend this book to anyone because it makes you jolly.This is all so sad and interesting.Thank you for letting me in the book club. It is such fun! Riya gave Knighthood for Beginners 5 out of 5 and now plans to read The Incredible Dadventure by Dave Lowe. This dragon taught everybody you can be whatever you want. It boosted my self~esteem.I didn't like the book that much. It was boring. It would've been better if it was more spooky or horror.I love horror. Yusuf gave Knighthood for Beginners 2 out of 5 and now plans to read Greta Zargo and the Death Robots from Outer Space by A F Harrold. Taio gave Knighthood for Beginners 4 out of 5 and now plans to read Amelia Fang and the Barbaric Ball by Laura Ellen Anderson. I absolutely loved this hilarious book. I love the fact it has got a German speaking goat and I liked Dave too. It was funny when the goat pretended to be a lady and the King fell in love with him however it was sad when he and Dave had a quarrel and broke friends. Holly gave Knighthood for Beginners 5 out of 5 and now plans to read The Incredible Dadventure by Dave Lowe. Emma gave Knighthood for Beginners 5 out of 5 and now plans to read Amelia Fang and the Barbaric Ball by Laura Ellen Anderson. The cute picture on page 150 is Dave breathing out fire and looking cute. I like this book because it has another book in it that's really good. I would tell my friends and family to read this book. Noah gave Knighthood for Beginners 5 out of 5 and now plans to read Amelia Fang and the Barbaric Ball by Laura Ellen Anderson. The book was about a little dragon and it was funny because he couldn't fight and he did everything wrong. Also he has a friend that's a German-speaking goat. Dave tries to be a knight but he can't do it right but he wears knights armor and uses a sword. His dream is to be a brave knight to protect the castle from other people. I would recommend this book for people who like medieval things. It was very funny and enjoyable but it wasn't my favourite. He ends up being a knight at the end but he takes a long time for him to learn the ways of a knight. He loved reading, I recommend this book for 5+. Its one of my favourite books. Harrison gave Knighthood for Beginners 4 out of 5 and now plans to read Attack of the Alien Dung! by Gareth P Jones. Awesome???. This book is totally epic i would score it 50000000 out of 5.?? ?I adore the character Dave since he is really cute and funny and I like the bit in the story when... Oh I won't tell you that yet.?????????????????????????????????????????? Maisy gave Knighthood for Beginners 5 out of 5 and now plans to read Greta Zargo and the Death Robots from Outer Space by A F Harrold. This book was quite funny. Dave was the first person to fail as a dragon but he was actually the best knight. Albrecht was a really funny character because he’d been on lots of adventures and knew about everything - even though Dave didn’t believe him. I liked it when he had to dress up in a girl’e Costume and dance. It was funny when he got the jousting stick stuck in his bottom and the bearded lady had to pull it out. I think lots of people my age would enjoy this book. Zak gave Knighthood for Beginners 5 out of 5 and now plans to read Amelia Fang and the Barbaric Ball by Laura Ellen Anderson. 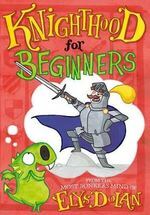 Knighthood for beginners is an incredible book for all ages and all genders. Dave the dragon is sent away from his family.? He tries to be a knight but will he get the job? Read the book and you will find out. Evie gave Knighthood for Beginners 5 out of 5 and now plans to read Attack of the Alien Dung! by Gareth P Jones. Zac gave Knighthood for Beginners 5 out of 5 and now plans to read Me and Mister P by Maria Farrer. I like this book because it is really funny book and I like how cute Dave is. Harrison gave Knighthood for Beginners 4 out of 5 and now plans to read Amelia Fang and the Barbaric Ball by Laura Ellen Anderson. This book was amazing and had many funny but scary parts!!! I cant believe I am saying this but this is the best book I have read so far. maiya gave Knighthood for Beginners 5 out of 5 and now plans to read Attack of the Alien Dung! by Gareth P Jones. I think that knighthood for beginners is a very funny book. I like how you add a German character. Dylan gave Knighthood for Beginners 5 out of 5 and now plans to read Amelia Fang and the Barbaric Ball by Laura Ellen Anderson. I like this book loads because there is a dragon called Dave and he tried to be a knight. His horse (or pretend horse) is a funny character. Francesca gave Knighthood for Beginners 4 out of 5 and now plans to read Me and Mister P by Maria Farrer. This book was good because Dave was a dragon but he didn't act like one. Milan gave Knighthood for Beginners 4 out of 5 and now plans to read Amelia Fang and the Barbaric Ball by Laura Ellen Anderson. It was really good because Dave the dragon is always different to all the other dragons. The moral of the story is never give up! Nadia gave Knighthood for Beginners 5 out of 5 and now plans to read Amelia Fang and the Barbaric Ball by Laura Ellen Anderson. I like this book because it has knights. Eathan gave Knighthood for Beginners 4 out of 5 and now plans to read Me and Mister P by Maria Farrer. I liked this book. It has some funny parts which made me laugh. I quite liked the dragon because he was really funny. The story worked out well for him. Isabelle gave Knighthood for Beginners 4 out of 5 and now plans to read Amelia Fang and the Barbaric Ball by Laura Ellen Anderson. I like this book because it has bad nights and good night's.I don't like the middle bit.I don't think it's bad or good I just like it. Rian gave Knighthood for Beginners 5 out of 5 and now plans to read Me and Mister P by Maria Farrer. I loved the book. I loved the way it was all magical and that a dragon was able to become a knight and a goat became a steed. It was a bit upsetting when Dave burnt the fuzzy bunny book. Ruairi gave Knighthood for Beginners 5 out of 5 and now plans to read Attack of the Alien Dung! by Gareth P Jones. I really enjoyed this book because it had tons of adventure and humor. Dave the dragon and Albrecht the mighty steed (a goat) are so funny that you would want to read it again and again. I would recommend this book to 5-11 year olds because it is sometimes a little hard to understand Albrecht's language. I would say that 4 out of 5 people would give this book 5 out of 5 stars. Madi gave Knighthood for Beginners 5 out of 5 and now plans to read Amelia Fang and the Barbaric Ball by Laura Ellen Anderson. This book was hilarious and Dave was SO cute when he was a baby. DYLAN gave Knighthood for Beginners 5 out of 5 and now plans to read Attack of the Alien Dung! by Gareth P Jones. The book was amazing I really enjoyed it and Dave it so cute, especially when he says "I need the toilet" that is so cute. and the best bit is when he had to pick a steed it had to be glossy, good looking, has an attitude and needs a fine physique and then... he picked xxxxxxxx that was hilarious. I loved it good job. Katie gave Knighthood for Beginners 5 out of 5 and now plans to read The Incredible Dadventure by Dave Lowe. I liked it because there was a lot of unexpected things and all the characters were funny. Lily-Rose gave Knighthood for Beginners 5 out of 5 and now plans to read Amelia Fang and the Barbaric Ball by Laura Ellen Anderson. I was surprised when one of the dragons said that he wanted to be different to the other dragons, It is good to be different. It is funny because some of the characters talk a different language. Carlos gave Knighthood for Beginners 5 out of 5 and now plans to read Amelia Fang and the Barbaric Ball by Laura Ellen Anderson.